Cook the Book Fridays, is currently cooking through Dorie Greenspan's latest cookbook, Everyday Dorie. This month's selection is Potato Chowder Lots of Ways. 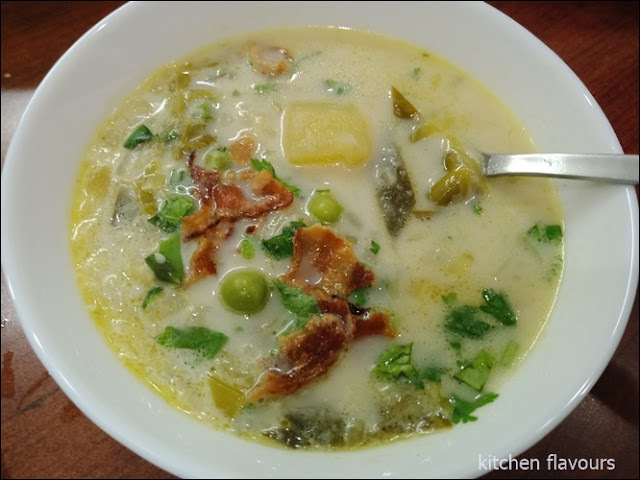 Dorie has given a few different ways (by way of ingredients) of making this chowder, with whichever vegetables and herbs as they come into season. Thinly sliced leeks, onions, shallot and garlic are sauteed in the bacon fat or oil until softened, then add the vegetable or chicken stock, together with the potatoes, let it boil, then simmer until the potatoes are tender. (I wonder how many of us actually rinse the thinly sliced onions, shallots and remove the germ of the garlic cloves. I did not.) As suggested by Dorie, I mashed some of the potatoes to add another texture to the soup. I've added some peas, and I actually bought a pack of sweet peas to add along, but completely forgotten all about it! Just before serving, stir in some cooking cream and heat without boiling. Spoon into serving bowls and top with some chopped crispy bacon and some chopped fresh herbs, which I've used cilantro. We thought that this chowder is delicious and full of flavour! I've tasted with and without the cream, definitely with the cream! Next time I'll cut the potatoes into smaller cubes, instead of bite-sized pieces. I'll be cooking this again, and as Dorie suggested, lots of ways, with other veggie add-ins! It indeed looks very flavourful and tasty, Joyce. this look sooo delicious ! I love potato chodwer! Yes, so many different ways to make this. Looks like everyone picked a winning combination! Ha! I didn't rinse the onions or remove the germ from the garlic:) Your soup looks delicious anyway! I can't wait to make this again! SO GOOD in every season! This is the perfect recipe for this cold winter weather that we are having. Yours look wonderful. That looks amazing! Such a delicious comfort food. I was going to ask everyone the same question about washing the alliums because I had never seen that suggestion before. I washed the sliced onions but then just decided it was not necessary. I really think the addition of cream at the end is what made it a chowder and delicious and special. This looks wonderful! I agree with you that it is really quite tasty and the versatility makes it something we can make again and again! i always remove the garlic germ, but wouldn't rinse an onion unless i am eating it raw-- haha. your chowder looks creamy and delicious-- i'm also looking forward to this making this lots more ways. Yours looks fabulous ! It was such a great recipe and will stay in my short list pile lol. Also fun to hear your opinion on with and without the cream. I was all set to add it in but so happy with it without that I didn't want to "tempt the gods". Will absolutely be giving a try next time. Your crispy bacon is making a strong statement on the chowder. If I have the time, i'd definitely not skipping out the bacon part. This was tasty, wasn't it? I am enjoying seeing how each person served this up. So many tasty options!